It's January, and you may be looking for some fresh starts in your life. So, now is a perfect time to grab a new mobile phone contract, for example, because frankly it beats the hell out of joining a gym or eating nothing but salad and lentils for the rest of the month. 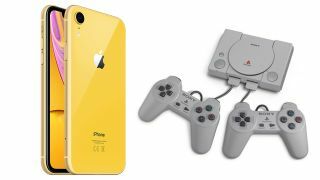 And, as an added incentive, Mobiles.co.uk are offering a free PlayStation Classic console (which is worth about £50) with selected iPhone XR contracts. Usually when getting a free gift thrown in, it means paying through the nose for a crap phone, and the retailer uses the gift to try to sweeten the deal, but in this instance the prices are pretty good. The cheapest one nets you 15GB of data, a 64GB iPhone XR (in yellow), and unlimited calls and texts for £34 per month. That's rather good when compared to other phone prices at the moment. If you're interested in more data, then Mobiles is offering 25GB for £38 p/m (with £140 upfront) and 20GB for £37 p/m (with £150 upfront). These are standard 2-year contracts, which is fine for the iPhone XR because it's powerful enough to run all the latest apps for a good couple of years. The battery will last 2 years too. For comparison, getting the same deal from O2 will cost you £165 upfront, and £45 per month thereafter for the exact same iPhone XR. So you're saving £10 per month and getting a free PS Classic. The comparable deal with EE is actually £50+ with less data, and if you were to buy the phone outright, it's currently £750 on Amazon. Sure, it's yellow, but you can always get a case if you don't like that. If you want more, here are the best gaming phones and the best gaming tablets in 2019.